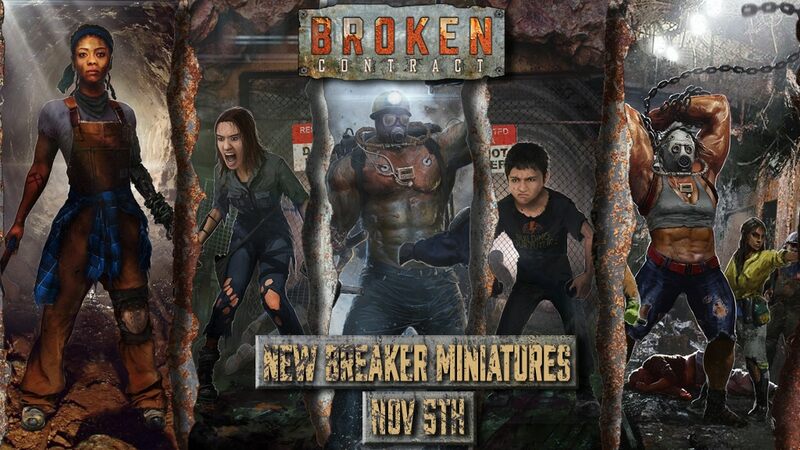 Broken Contract has been designed as a micro-skirmish game and narrative play. Immediately, for many gamers, this conjures images of "post game sequences" where loot is accumulated, experience is earned, and crippling injuries and death are sometimes meted out. These post game sequences are often the source of triumphant die rolling and curses over foul luck. 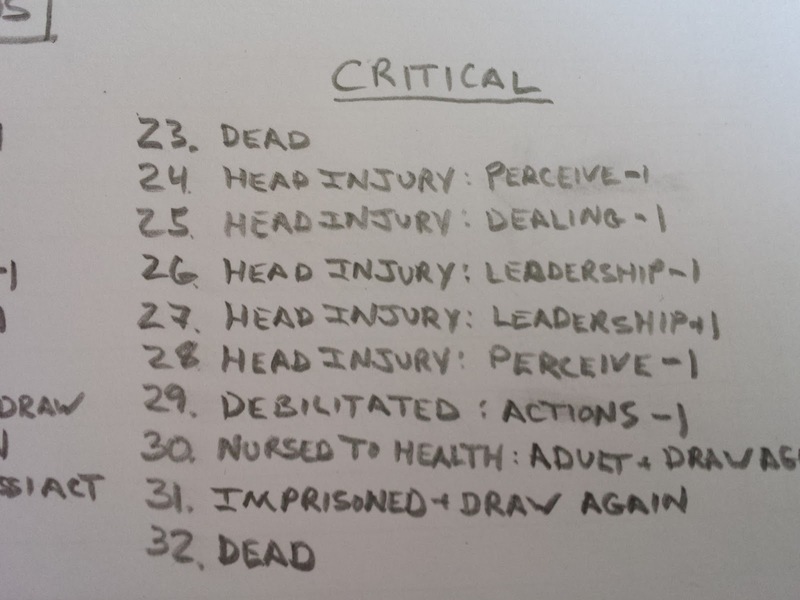 One of the things I wanted to address in Broken Contract was the nuance of injury and death. 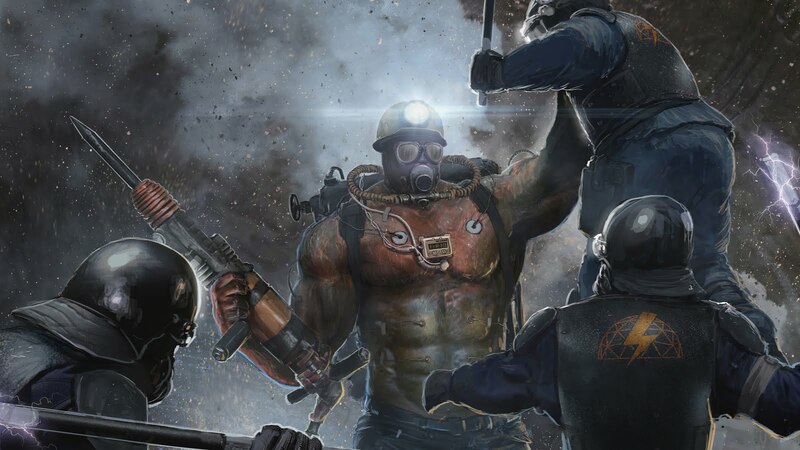 Should an unconscious Down Character have the same chance of death as a Character who endured a chop from an Oversized Rock Saw and ended them game in Critical condition? How should I address this? 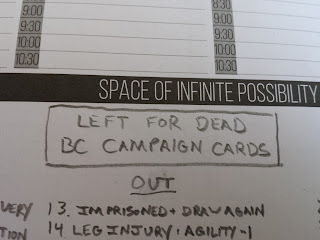 One of the things I had started looking at last year was doing a deck driven campaign system. This would allow not just the ability to have a large selection of options (a standard mini deck is 32 cards), but it also meant that I could theoretically set up circumstances to add or remove cards. If I wanted to increase the fatality or head trauma results of a weapon, I could always issue a card to go with said weapon that could be shuffled into the deck. There are no immediate plans for such things, but charts feel very final. Decks, however, feel wide open to tweaking. Let's take a look at the current incarnation what I dubbed the "Left for Dead" deck. 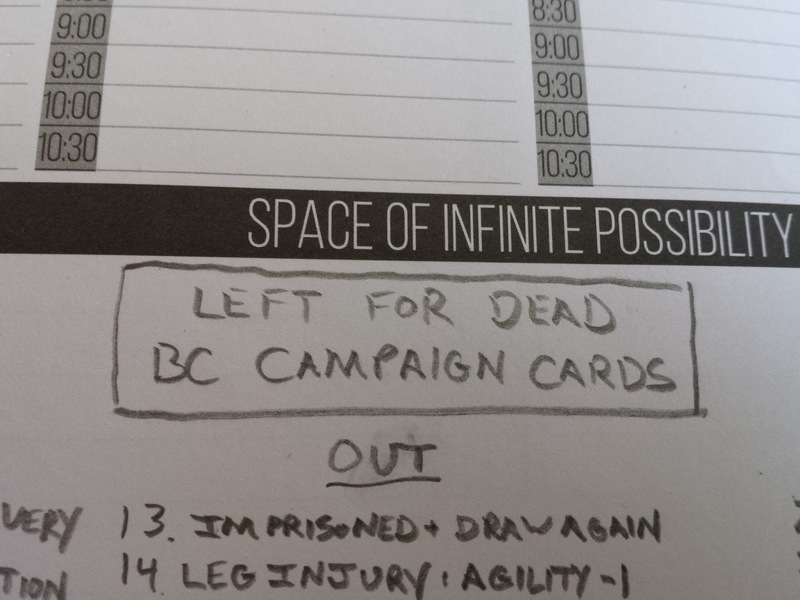 The Left for Dead Deck would feature 32 cards that would be numbered in 3 groups: 1-12, 13-22, and 23-32. These would then correspond to how grievously wounded a Character was at the end of the game. Before grabbing the deck, and models "Left for Dead" would make a Recovery roll to see if their status improved or worsened. Then, it would be time to face their fate. 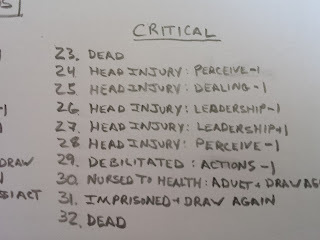 A Character that ended the game Down would draw from a deck of 12 possible outcomes, a Character that was Out would draw from 22 possible outcomes, and finally, a Character that was Critical would face 32 possible outcomes. Those outcomes would look something like this. The Down portion of the Left for Dead deck would contain all "non-fatal" cards. 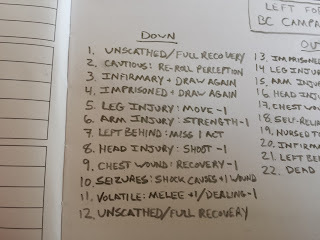 There is a high chance of Full Recovery, being captured and sent to the Infirmary or Imprisoned to be rescued (Note: this deck would be specific to the FerrumSky campaign setting) but there are a few injuries that would really be annoying. They target key performance Stats to balance out the higher chances of Full Recovery. 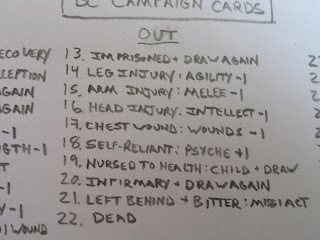 The Out portion of the deck adds in the first Dead result, more key Stats being undermined, and some unusual results like Self Reliant, Nursed to Health, and Bitter which improve a Stat, can add another Character to your group, or can affect your Dealing checks with a particular Faction. 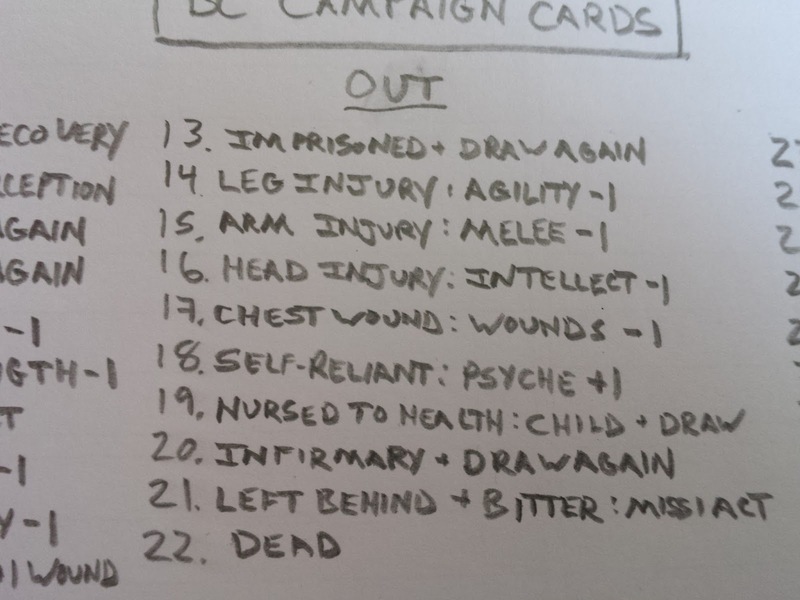 I'm not 100% tied to they placement of the various bodily injury cards which will eventually get unique names, but the chances of Full Recovery and Imprisonment/Infirmary are higher the less substantial the injuries are and the chance of Death increases dramatically based upon the drasticness of a Character's condition. I think that is as it should be. 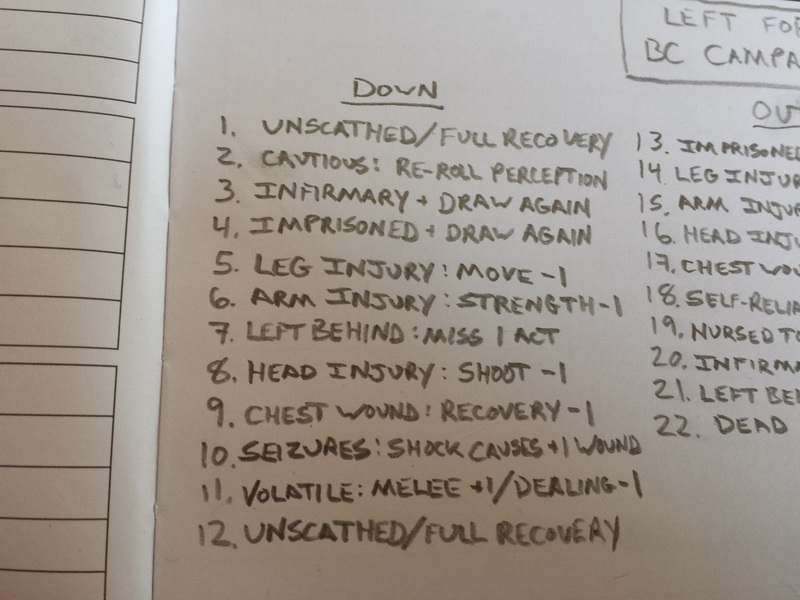 I'd love to hear everyone's thoughts and feedback on this sort of structure for injuries. Let me know what you think in the comments.